With the All England show just a few weeks away, I've started to review the fish I hope to exhibit. This one I thought would have been my best chance of a placing. last time I measured it just a few weeks ago, it was 32cm. Been holding it off the food all season.... Should be easy enough to hold in size 2 I thought. Today, it's jumped to 36cm and it's so frustrating that it's grown out of size 2. Probably won't take it now. And, I've missed all that growing time with it!, in trying to hold it back. If I'd gone for it this summer - it might have been a better bet for size 3. Chucked it into the females tank this afternoon to make the best of the rest of the year's potential growth. You never know, if it puts on some good growth over the next 3 weeks i may still take it. 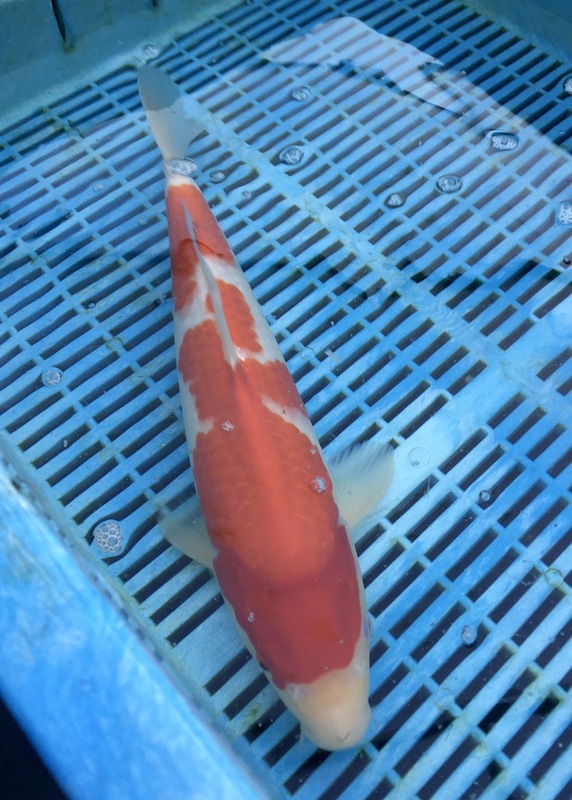 And with my other best bet in size 2 also outgrowing the size...And my best size 4 throwing a shimmi, I'm looking a little short on fish that are good enough to stand a chance against the typically high standard of kohaku's you get at the show every year. My hopes are now in a great little size 1, which measured 24cm today. I just have to keep my fingers crossed that I can keep it within size 1 for the show. And I have one or two 30/32 cm fish as they stood a few weeks ago , from the august 15 spawning. but to be honest, i think they'll have outgrown size 2 by the time of the show. i then have my sharkey aka nissai - and they are growing really well. it's a balancing act with them because anything I take to the show will be taken out of the growing environment for at least a month - a week before the show, then a few weeks post show quarantine. Amanda's keen for us to show off our marmite kohaku. she's becoming quite a notable fish in our collection. the fish going sansai this summer - I have two females from the 2015 spawnings. both are possible show fish, but I think they need another year or two to mature before they are ready.